oppo has been absent in the flagship smartphone space for a very long time. The company’s last flagship smartphone was the Oppo Find 7, which was released back in 2014. 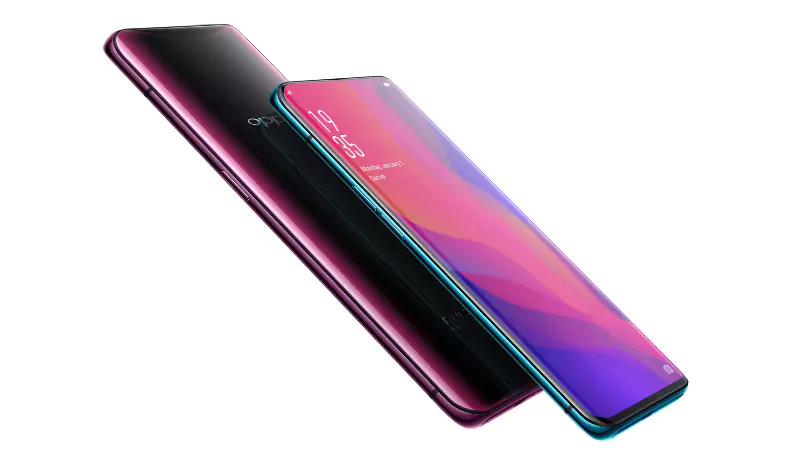 After three years of releasing phones with mid-range chipsets, Oppo announced the flagship Oppo Find X last month. Now, the company has launched the Find X in India. The phone will be available for pre-order via Flipkart from July 25, with sales beginning from August 3. Separately, Qeexo has announced that the Find X uses Qeexo’s EarSense technology instead of a traditional proximity sensor. Finally, the phone also integrates audio solutions from Dirac. The Oppo Find X is a different kind of flagship smartphone. Its design is different from any other smartphone on the market today. That’s because the smartphone has thin bezels on the front (with 93.8 percent screen-to-body ratio) and no notch. The company was able to achieve the near bezel-less design by replacing the hardware proximity sensor with Qeexo’s EarSense (more on this below), and by opting to go for a motorized camera solution. Whereas the Vivo NEX S goes for a popup front-facing camera, the Oppo Find X goes one step beyond and opts for a motorized camera sliding mechanism for both the front-facing as well as the rear cameras. The Oppo Find X does not have a fingerprint sensor. This makes it an outlier among other 2018 Android flagships. Instead, it uses 3D structured light for 3D facial recognition, Apple Face ID-style. The phone is the first Android smartphone to use a structured light solution, with a dot projector, flood illuminator, infrared camera, ranging sensor, and receiver. It uses 15,000 dots and “intelligent analysis” to unlock the phone. Oppo states that the sliding mechanism has been tested 300,000 times for durability. In terms of software, the Find X is powered by Android 8.1 Oreo with ColorOS on top. The Oppo Find X will be available for ₹59,999 ($875) in India. It will be available online exclusively via Flipkart. It will also be available via offline channels. Sales will start online a day ahead of offline availability, with pre-orders on Flipkart starting on July 25. Sales will begin from August 3. Oppo also stated that it plans to launch the Oppo Find X Lamborghini Edition in the Indian market, but the company didn’t give any details on price or release date. Qeexo is a developer of lightweight machine learning and AI solutions for sensor data. On Thursday, it announced a partnership with Oppo to bring Qeexo’s EarSense technology to Oppo smartphones. EarSense was introduced last year as a proprietary software alternative to a proximity sensor. Qeexo describes it as a “state-of-the art AI solution” that allows for a “true bezel-less” design. It does this by replacing the hardware proximity sensor on smartphones and allowing devices to turn off the screen during phone calls. The company notes that hardware proximity sensors must be placed at the top of the smartphone, thus requiring phones to be made with bezels or notches. EarSense on the other hand is the first software-only AI solution to replace the hardware proximity sensor. It was built on the same AI platform as Qeexo’s FingerSense, which powers Huawei’s knuckle gestures, and which has been deployed on over 120 million devices. Qeexo states that EarSense’s proprietary AI algorithms identify a person’s face and ear when they are near or touching the screen, letting the device turn off the screen during a call. As it replaces the proximity sensor, EarSense makes it possible for device makers to remove top bezels and notches from phones to create better designs. Dirac has announced a collaboration with Oppo with the launch of the Find X. The Oppo Find X integrates three Dirac solutions – Dirac HD sound, Dirac Power Sound, and Dirac Sensaround. The two companies have been partners for five years. The Oppo Find X doesn’t have a 3.5mm headphone jack. In the software side, it integrates a suite of digital audio solutions from Dirac that includes the Dirac Power Sound speaker optimization solution, Dirac HD Sound earphone optimization solution, and Dirac Sensaround soundstage widening solution. Dirac states that it has collaborated closely with Oppo from the onset of the Find X project to develop a complete speaker system that involves the speaker, the speaker placement, speaker cabinet, amplifier and DSP to ensure that the Find X has impressive sound quality. Dirac Power Sound is adopted to optimize the overall sound quality by improving the speaker’s frequency response and impulse response to enhance its volume and optimize bass. The digital solution is developed for small loudspeakers such as the one found in Oppo Find X to achieve the potential of small speakers that have traditionally faced many constraints such as inherent acoustic flaws, small transducer and sub-optimal placement. The earphones of the Oppo Find X are powered by two Dirac solutions. The company states that Dirac HD Sound is an audio optimization solution that improves the performance of earphones by correcting their impulse and frequency responses. These two parameters play a significant role in determining sound quality of any speaker or earphones. The Dirac Sensaround soundstage widening solution, on the other hand, is automatically applied when users play media content from any headphones. The sound “externalizes the sound” and creates an “immersive-like listening experience without requiring specifically-coded audio content,” according to the company.